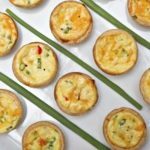 Delicious egg muffins that are so easy to make. Perfect for a super healthy breakfast or afternoon snack. Gluten free, dairy free (if you do not add cheese as a topping). They also freeze well and are easy to reheat. Oil the muffin tin with a little oil. I like to use coconut oil or a little ghee. But any oil you use at home will be fine. Whisk 7 eggs, 2 tablespoons milk (dairy or non-dairy), salt and pepper to taste. Divide your ingredient combos evenly into tin. Pour enough egg mixture in each well to come to the top. Garnish with a pinch of grated cheese if you want. For extra protein, you can add a tablespoon of cooked quinoa into the mixtures too, and get a crunchier texture. The nutrition information will vary slightly depending on the different toppings you will use.